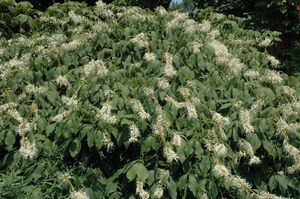 'Rogers' Bottlebrush Buckeye has long white panicles that bloom even later than A. serotina. 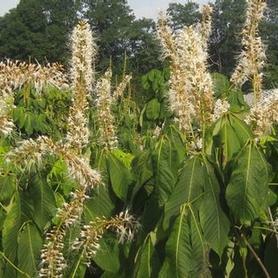 Aesculus parviflora var. serotina 'Rogers' is a wonderful J.C. McDaniel selection. These plants are on their own roots. A. parviflora var. serotina 'Rogers' is wet site tolerant, and the best blooming Bottlebush Buckeye by far.